In 1684 the Christian armies laid siege to Buda (Ofen) to drive out the Turks, who had held possession of the city from 1541; their design was, however, frustrated by the stout resistance of the Turks and Jews. The participation of the latter in this opposition to Christian forces was followed by great embitterment against the Jews, particularly in Italy, where in Rome they could not venture into the street without a guard from the pope's troops; any not thus protected being sure of immediate assault and possibly murder. The towns of Moncellis, Montaniana, Castel-Franco, and Citadella followed the example of Rome; and in Padua, where Jews and Christians had lived side by side for many centuries, a sharp outbreak of anti-Jewish feeling was felt in 1670. The outbreak in that city was the outcome of commercial jealousy, brought to a head by a calumnious publication which was widely circulated among the people. Although the publication was interdicted by the authorities, it nevertheless implanted deep animosity against the Jews; and when the news came of the part which they had taken in the defense of Buda, the latent hatred broke into flame. The Capuchin Marco d'Aviano, who had passed two months with the besieging armies outside Buda, when asked concerning the part which the Jews had taken in bringing disgrace upon the Christian armies, replied truthfully that the Jews of Buda were not blameworthy. The populace, however, refused to accept this generous estimate, and pictures of Buda in which the ghetto was over-prominent were widely circulated, greatly increasing the popular resentment. 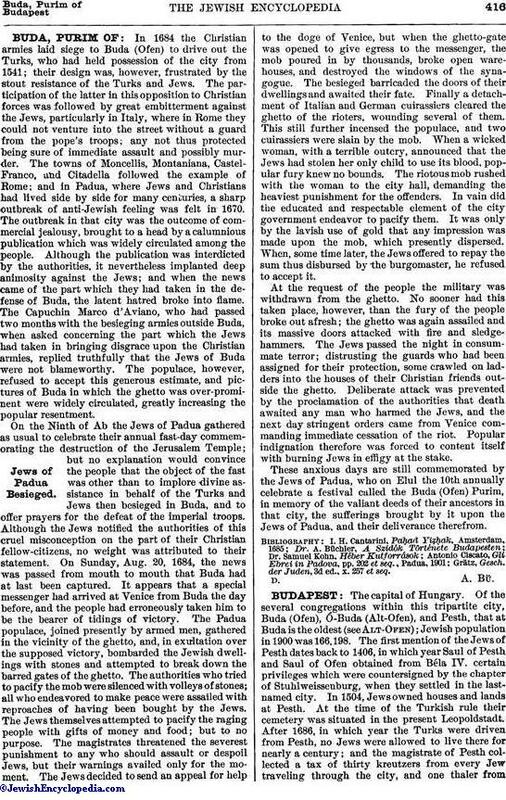 On the Ninth of Ab the Jews of Padua gathered as usual to celebrate their annual fast-day commemorating the destruction of the Jerusalem Temple; but no explanation would convince the people that the object of the fast was other than to implore divine assistance in behalf of the Turks and Jews then besieged in Buda, and to offer prayers for the defeat of the imperial troops. Although the Jews notified the authorities of this cruel misconception on the part of their Christian fellow-citizens, no weight was attributed to their statement. On Sunday, Aug. 20, 1684, the news was passed from mouth to mouth that Buda had at last been captured. It appears that a special messenger had arrived at Venice from Buda the day before, and the people had erroneously taken him to be the bearer of tidings of victory. The Padua populace, joined presently by armed men, gathered in the vicinity of the ghetto, and, in exultation over the supposed victory, bombarded the Jewish dwellings with stones and attempted to break down the barred gates of the ghetto. The authorities who tried to pacify the mob were silenced with volleys of stones; all who endeavored to make peace were assailed with reproaches of having been bought by the Jews. The Jews themselves attempted to pacify the raging people with gifts of money and food; but to no purpose. The magistrates threatened the severest punishment to any who should assault or despoil Jews, but their warnings availed only for the moment. The Jews decided to send an appeal for help to the doge of Venice, but when the ghetto-gate was opened to give egress to the messenger, the mob poured in by thousands, broke open ware-houses, and destroyed the windows of the synagogue. The besieged barricaded the doors of their dwellings and awaited their fate. Finally a detachment of Italian and German cuirassiers cleared the ghetto of the rioters, wounding several of them. This still further incensed the populace, and two cuirassiers were slain by the mob. When a wicked woman, with a terrible outcry, announced that the Jews had stolen her only child to use its blood, popular fury knew no bounds. The riotous mob rushed with the woman to the city hall, demanding the heaviest punishment for the offenders. In vain did the educated and respectable element of the city government endeavor to pacify them. It was only by the lavish use of gold that any impression was made upon the mob, which presently dispersed. When, some time later, the Jews offered to repay the sum thus disbursed by the burgomaster, he refused to accept it. At the request of the people the military was withdrawn from the ghetto. No sooner had this taken place, however, than the fury of the people broke out afresh; the ghetto was again assailed and its massive doors attacked with fire and sledge-hammers. The Jews passed the night in consummate terror; distrusting the guards who had been assigned for their protection, some crawled on ladders into the houses of their Christian friends outside the ghetto. Deliberate attack was prevented by the proclamation of the authorities that death awaited any man who harmed the Jews, and the next day stringent orders came from Venice commanding immediate cessation of the riot. Popular indignation therefore was forced to content itself with burning Jews in effigy at the stake. These anxious days are still commemorated by the Jews of Padua, who on Elul the 10th annually celebrate a festival called the Buda (Ofen) Purim, in memory of the valiant deeds of their ancestors in that city, the sufferings brought by it upon the Jews of Padua, and their deliverance therefrom. Grätz, Gesch. der Juden, 3d ed., x. 257 et seq.